is that a little wine goes a long way and your guests can drink more without getting as buzzed. Recently, a few friends requested my recipe and it occurred to me that our readers might enjoy it as well. After reading this post you’ll have 6 drink options (this along with the 5 Lindsay blogged about Tuesday) for any parties you host over the Labor Day weekend! Any kind of wine will work - Chardonnay, Pinot Grigio, Shiraz, Merlot, Malbec, Pinot Noir and the list goes on. Feel free to use a red or a white of any variety… whatever tickles your fancy will do just fine. 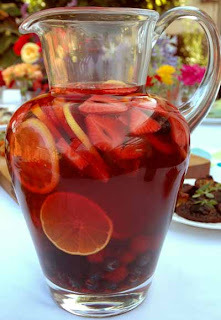 Get the cheap stuff - you don’t need a hoity toity, high dollar bottle of wine when making Sangria. As a matter of fact it would be a waste of money because the fruit and other ingredients would mask its flavor. I’ve spent less than $6 on a bottle before and no one could tell the difference. Grab whatever fruit you have – I like to cut up thin orange slices just because they look so pretty in the pitcher; add lemon and lime to give even more color/zest to your drink. Dicing apples into small cubes also adds a lot of flavor. Sugar is not needed – trust me, this recipe won’t need sweetening. I see Sangria recipes call for sugar all the time and I think that’s just adding unnecessary calories to your drink. Put the sugar away, it’s delicious enough without it. 1) Slice up your fruit and place in your pitcher. Easy enough. 2) Dump your bottle of wine over the fruit and let this sit in the refrigerator until guests arrive. I usually let it marinate for about an hour so it’s nice and chilled. Again, you can do this with white or red, both are great cold. 3) When you’re ready to serve, crack open a chilled can of sprite and dump that into the mixture. I use diet sprite because it’s what we drink around here. 4) Next add a small bottle of tonic or club soda. I don’t know the exact amount; I think the bottles I pick up are around 7 - 8 oz each. Stir and serve, ice is optional.